a blog about food preservation and other botanical adventures – because plants are cool! Pickling experiment – the results are in! In case you missed it, a few weeks ago I wrote a post about two ways that you can keep your pickles good and crispy when making quick pickles. That post can be found here, and if you missed it just head over and read that, I pasted this entire post there as well. So, I know you’ve been on the edge of your seat wondering what the results of this experiment would show, so here they are. As a reminder, what I did was 5 different pickles. The pickles were all the same spices and brine, it was the processing that differed. The first 4 were all canned as slices, the fifth was canned whole and sliced for the taste test so people couldn’t tell which one was canned whole. I randomly assigned them to a number 1 though 5 for people to taste test. For this taste test I had 17 people test the pickles and rate them from least to most crisp. I wasn’t entirely sure how to analyze the data from the taste test, but some of the results are pretty obvious and exciting. I am going to just give you a few summary statistics that I really think give a pretty clear answer, and I’ve also included all the ratings in case you are really that interested. First off, I wanted to show a picture of the four sliced ones, because even visually some of them looked more crisp, at least to me. Below the jars are in the order listed above, so the two ends were boiled, and the middle two were processed at low temperatures. Can you see a difference? This picture was taken 5 weeks after processing. I think that even visually the boiled ones look soggier. They are a different colour and more translucent. So how did it break out in terms of numbers? The first obvious result was that 16/17 people put sample 5 as the most crisp sample. 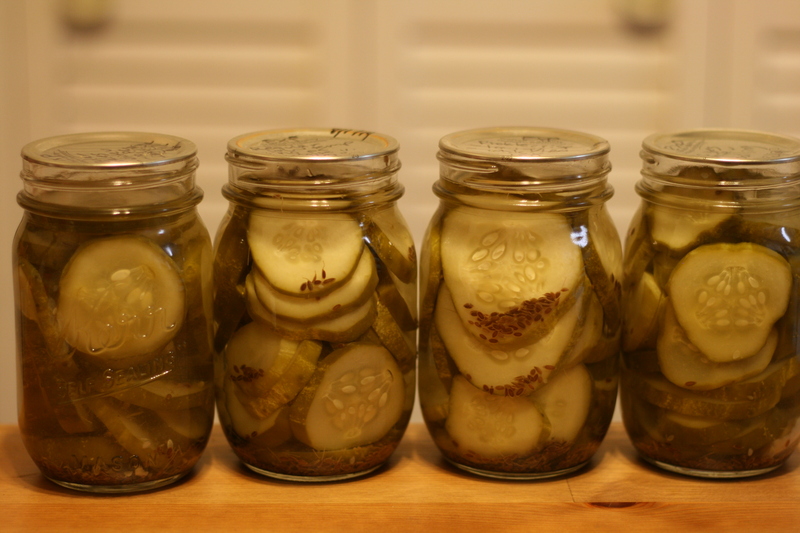 So, by canning your pickles whole, with low temperature pasteurization, you get a very crunchy, firm product. Great! Now let’s ignore number 5 for a second since it had an additional variable of being canned whole. 10/17 people chose sample 1 as the softest, and 6/17 chose sample 4 as the softest. This totals to 16/17 people chosing one of the boiled ones as the soggiest. Additionally, of the sliced ones, 13/17 people selected sample 3 as the most crisp, which was the low temperature with pickle crisp sample. Now, I didn’t run any actual stats, but I feel pretty confident saying this: Low temperature pasteurization for the win!! There was not one person that had sample 1 (boiled, no pickle crisp) as anything other than the soggiest or second soggiest. I also thought it was really interesting that Janice, our canning teacher, rated them in the exact order that I would predict. From soggiest to crispest: boiled without pickle crisp, boiled with pickle crisp, low temperature without pickle crisp, low temperature with pickle crisp, low temp with pickle crisp canned whole. Pretty fun! So the method of processing, low temp versus boiling, was detectable by most people. Some people could detect a difference with the pickle crisp, but this result was not as ground breaking. I’d like to test it again, with more people and try doing a boiled one canned whole and a few other things, but I think for now it’s safe to say I will be canning the rest of my pickling cucs at low temps and using pickle crisp. They still turn out well if you don’t can them whole, even though most people picked that for ultimate crispness, but you can also fit less in a jar. So there ya have it! Go can some pickles at 180 F!! This is such an exciting experiment! I’m enough of a fiend for crisp pickles that I had basically given up on canning and was only making fresh refrigerator pickles, but now? I am totally going to try low-temp pasteurization. PICKLES! Yes I totally agree! I made so many refrigerator ones last year but this really works! Give it a try I’d love to hear how they come out for you! wow, I *never* thought that my last-minute pickle refrigerators are actually better. Now I can always claim I do them because they’re crisper, and not because I forgot to go to the market, but 20 lbs of cucumbers, prepare a hot water bath, process the jars…. Oh who am I kidding, I didn’t forget, everyone knows I’m lazy. Thank you for this! 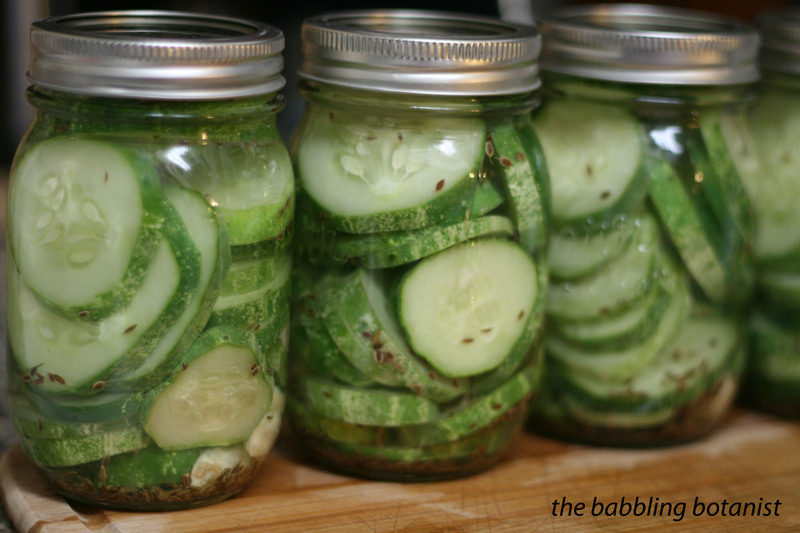 I’ve tried canning cucumber pickles a couple of times and been so discouraged by the sogginess that I haven’t tried again, even though I love pickles. I was doing EVERYTHING POSSIBLE the soggy way, based on this information! You’ve inspired me to give it another try. I am so glad to hear you’re inspired Christine, I hope they turn out well for you. I’ve tried to do the low temp method but can’t seem to hit the temperature range and hold it. I have a gas range. Any thoughts on how to manage the temps? I find it to be fairly hard as well, and I have to treat it the same as pressure canning where I turn the burner down as I approach the 180 F mark. I find that if I turn the burner down to about 3 or 4 I can maintain it in the right temperature range. I keep it on high until I’m getting close, maybe 165 or so, then turn it down a bit, then turn it down to pretty low once I’m at 180. I have an electric range, but I think the concept should be the same. Usually my issue is overshooting the temperature. If you are having that problem, you can leave the lid of the canner half ajar to let out some heat and turn the burner down quite low. Water has a high heat capacity, so once it is up to heat it will maintain temperature on a fairly low burner setting, then you can just turn it up a bit if you notice the temperature dropping. It’s definitely difficult to get the knack for it, but I think it’s worth persisting. Hope that helps! Botany Barn – Where has the Babbling Botanist Been!? like the botanist on facebook!